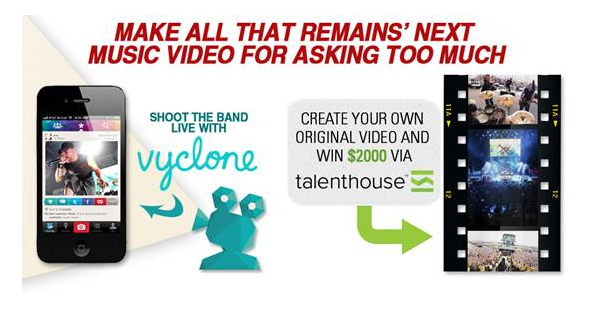 (New York, NY) – All That Remains has launched a fan-created music video contest for their new single, “Asking Too Much,” with creative collaboration site, Talenthouse. The contest, running through June 24th is for a fan-created music video for their new song “Asking too Much.” All That Remains has also partnered with social video platform, Vyclone to encourage fans to film and upload All That Remains performing “Asking Too Much” during their current tour using the Vyclone app. These fan-created videos will be used online across official All That Remains websites and social outlets. All That Remains is currently on the road for a series of festival dates in May and will head to Latin America in June. ATR will join Volbeat and HIM on tour later this summer for the Rock Allegiance Tour (tour dates below). The band continues to tour in support of their 2012 release, A War You Cannot Win (Razor & Tie). All That Remains’ second single from their new album, “Asking Too Much,” is already Top 20 at Active Rock Radio on both Media Base and BDS Charts and continues to climb. The band’s first single, “Stand Up” spent three weeks at #1 at Active Rock Radio. This marked the band’s first ever #1 radio single and ATR’s 5th consecutive Top 10 single at the format. A War You Cannot Win debuted at #13 on the Billboard Top 200 with over 24,700 units soldin its first week and has sold over 65,000 to date and is currently on the Billboard Top 200 Album Chart. ATR has sold more than 1 million units to date and 1,460,000 tracks to date. This entry was posted in Artist, Bassists, Drummer, Guitarists, Heavy metal, Internet Radio, Metal, Music, Rock, Rock N' Roll, RockStar, Tattoos, Thrash Metal, Wornstar Clothing and tagged All That Remains, Asking Too Much, Bleach Bang, Bleach Bangs, Bleach Bangs Radio, Charlie Owens, Chris Bartlett, Dan Egan, Hard Rock, Heavy Metal, Jason Costa, Jeanne Sagan, Matt Deis, Metal, Mike Martin, Music, Oli Herbert, Philip Labonte, Randy Norris, Rock, Rock N' Roll, Rock Star, RockStar, Shannon Lucas, the Hellion, the Hellion Rocks. Bookmark the permalink. ← Zeb Christensen from Screaming For Silence fills us in!